Definitely looks like a beautiful flower! It’s a spring favorite here. It often grows as a companion to bluebonnets, and depending on how they mix in a field, the combination of reddish-orange and blue can turn the field purple. Of course, even on their own, they’re delightful. 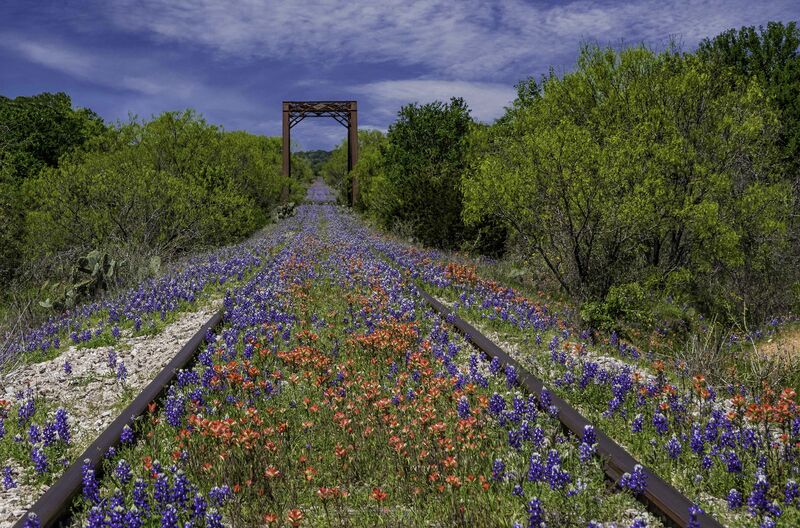 Here’s a nice view from Kingsland, Texas that shows a mix along an old railroad track. Beautiful! The Texas Lupinus subcarnosus is also in FL according to the USDA. Maybe I’ll see it eventually. The link from Kingsland is beautiful! It’s always fun to find a wildflower far outside its “normal” season. I discovered one of these flowering in my neighborhood on December 11, 2011. Since 11 seems to be the number of the day (I’ve seen your current post) I’m wondering if it took you 11 minutes to find it. Number humor aside, it is fun to find the seasons overlapping. This paintbrush wasn’t more than a foot away from the last shriveled fruits of a silverleaf nightshade. After six years, I don’t remember how long it took to find that out-of-season paintbrush. It would certainly have stood out and called attention to itself. Silverleaf nightshade is so common in Austin that its fruits, in some stage or other, are pretty much a permanent fixture here. Just shows you how life survives. We are having a 40C day and things are wilting, Linda. After a tumultuous Christmas and dear Helvi recovering from 11day hospital stay as a result of chemotherapy, things will soon get back to normal. I will start watering the garden tonight. I’d wondered about your absence, Gerard. Of course I’d attributed it to general holiday frivolity, which hardly was the case. Give Helvi my best, and my best to you, too. It sounds as though you’re both at home now; I certainly hope life can settle a bit, and that Helvi does well. Your mention of 40C is a reminder of how great the differences between the northern and southern latitudes can be. While we’re celebrating getting above freezing, you’re headed for the water hose to guard against heat wilt. Water on! When I first see early jonquils, I feel the worst of the winter is past…. a delusion, but it helps. It was one of those days when we didn’t know what to expect. A combination of controlled burns, freezing weather, and normal seasonal change had left things a bit bedraggled. The birds were mostly beyond the reach of my lens, so it was delightful to find a few flowers left over from the fall, and this pretty little over-achiever along a ditch. I’m hoping to get back out today, solo, rather than with friends. I enjoy the company, but, for whatever reason, I never do my best photography when others are around. Good photographs often take time. It’s hard for a photographer to put in the necessary time when other people want to keep moving on. Even when people are entirely accomodating and insist that it’s fine to dally, after a few shots it’s often clear that they really do want to move on. Divided attention can be an issue, too. Chatty conversation and concentration don’t combine well: at least, for me. Beautiful photo. Gorgeous actually. The poor plant looks cold. The flower and the bracts do look like they’re being wrapped in the leaves like a blanket. I thought the most interesting detail was the edge of the leaves. They’re clearly cold-nipped, but their color complements the flower beautifully. When the landscape is generally drab, a spot of color like this really shines. Ever hopeful – love it! Mary Lou over at Naturefreak has a winter blooming flower today too – I wonder what’s up?! Perhaps Nature’s as happy to have 2017 in the rear view mirror, too, and is trying to get a jump on 2018 — you think? I think it will be rather awhile before I see that here, but hopeful I shall remain! These don’t generally bloom until around March, so this one’s quite early. I hope you get a little hint of things to come in your own part of the world — like early snowdrops, or hyacinth, or daffodils. It is fun to find plants whose bloom time, well, just shouldn’t be. And yet… Nice shot! I think we’ve just been given a great example of a precocious plant. I’m used to seeing early bloomers after a stretch of warm weather, but the refuge had more snow than we did, and certainly plenty of below freezing temperatures. On the other hand, I think of Indian paintbrush as one of the hardiest plants, and this one certainly proves it. Aren’t snowdrops one of your earliest flowers? The name certainly suggests it, although when I lived up north I remember seeing daffodils and tulips pushing through snow, too. We didn’t have crocus, but a friend on the east coast has shown photos of them in late snow, too. It is a treat to see them; there’s no question about that. It’s interesting to see the various paintbrushes. We have three species, I believe, but look at how many are listed on the BONAP maps. Some are shown in only one state, but a cursory glance seems to show several species in your area. I’m anxious to see what happens on the prairies and refuges where so much burning has taken place. Some of those areas were thick with paintbrush a couple of years ago. I hope they come back. Thanks, Linda. Those maps were impressive. With all of my wandering in wild areas throughout North America, I’ve certainly see a variety, but I didn’t have an idea that there were so many. You’re absolutely right, about the ability of plants to regenerate. Still, one of the mysteries I’ve found is that a certain flower may show up in abundance in a particular spot for a year or two, and then suddenly not appear. There are reasons, no doubt — but what they are, I can’t say. It adds to the fun, and sometimes to the frustration. Mother Nature doing her thing, Linda. :) It’s possible the micro-environment changed for some reason… i.e. becoming wetter or drier. Every time I turn around I’m reading about another bit of chaos added to the pile — although, to be sure, it’s mostly in NYC. The latest was a broken pipe that was flooding the international terminal at JFK. We may think we have it bad down here, but we don’t have it NYC bad, or Boston bad, for that matter. Blue crystals, rosy cheeks, and red noses are just fine. As long as you stay away from the yellow snow, you’ll do fine. :) Possibly 50 degrees by Friday! Slushies all around! I might not have believed you a year or two ago, but this past year I’ve seen so many flowers that were “early” or “late” it’s become clear that they’re working on their schedule, and not ours. This weekend there still was one blooming clump of camphor daisy to go along with the paintbrush, and both were delightful after so many gloomy days. Exactly so — and if spring decides to arrive a bit early this year, who’s going to complain? We’ve had fires, floods, and pestilence of various sorts in the past year; some pretty flowers and fresh breezes would be nice. I’ve had roses up until last week. Amazing. Maybe next summer I’ll have Indian Paint Brushes in my flower bed . . . .! You know, there’s an area near me that had roses last summer, until they faded away. Last week, after our snow and cold weather, they were in full bloom again. I know nothing about roses, but I know it was great to see them. I need to go by for another look; they’re the prettiest salmon color. Whatever you end up with from that mix, I’ll bet it’s going to be fun to watch them grow. Despite being so cold in December, we still haven’t had what I call the winter “drearies” — those gray, gloomy days that just go on and on. Still, I was more than happy to see this little gem, and to get its photo without putting my knee (or worse) in the fireants that had it surrounded. There were mosquitos out, too. Everyone claims that freezes will kill them off, but our below-freezing days didn’t get them all. Ugh, forgot about the fireants. I was primed, too, but Winter is making a last stand here this morning. It’s sleeting right now, and earlier rain has meant iced-up roads. 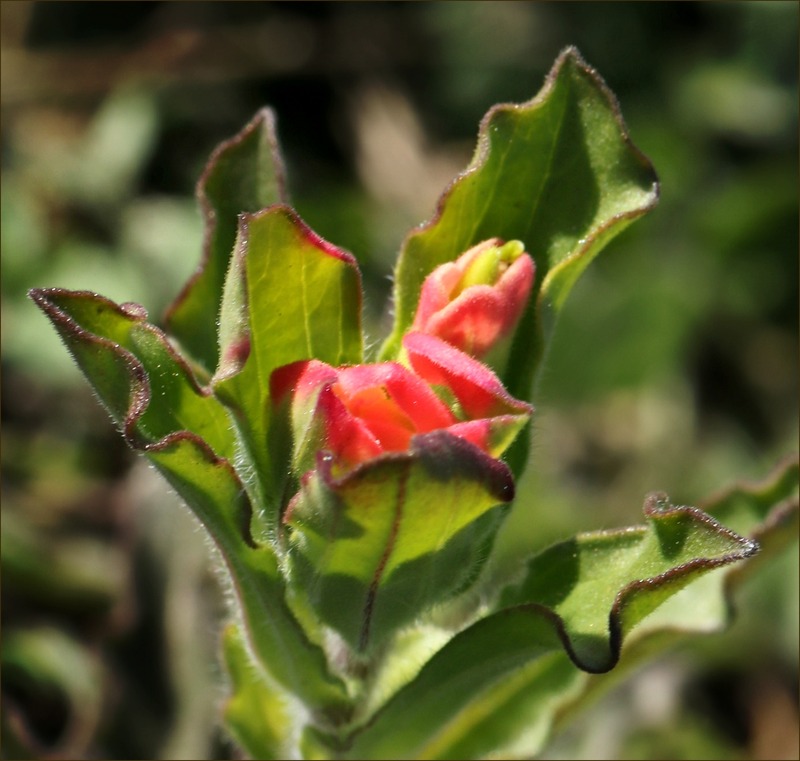 A friend one county over, where I found this Indian paintbrush, is reporting snow. We’re heading for the twenties tonight — I suspect this little gem, and the goldenrod I found this weekend will be retreating before the onslaught. On the other hand, this is exactly what winter in coastal Texas was like when I first moved here. Since I can stay inside with hot tea and pretty pictures, it’s all good! It’s good to be able to watch the changes from inside….and connect with people all over the world while we do….stay safe and warm!